Attack of the Burger Monster! 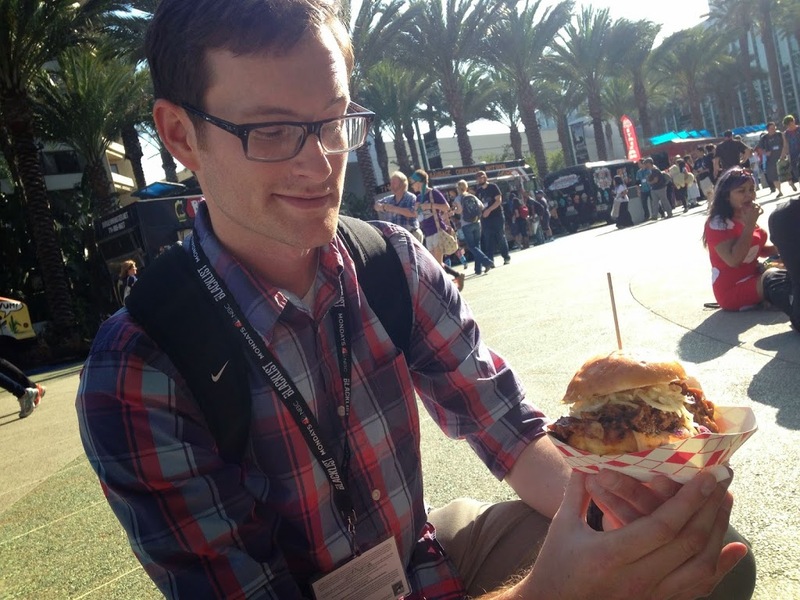 Home / Uncategorized / Attack of the Burger Monster! Something you may not know about me, unless you follow me on twitter here, is that besides sandwiches I also enjoy reading comic books. So, in order to fill my love of Iron Man, Hellboy, Spider-Man, Batman, etc, I tend to visit a few comic conventions a year. I’ve done Comic Con before, Comikaze and a number of other ones, but this past weekend was one of my favorites: Wondercon in Anaheim. After a day of wandering aisles with friends, looking at trades, art, and numerous things that would fall under the subject of pop culture, we left the Anaheim Convention Center at the end of the day to be greeted with a number of fantastically smelling food trucks. Inspecting each of the trucks available, and trying not to decide just with my stomach, I ended up picking Burger Monster. Their burger selections seemed fantastic, and their logo cracked me up. 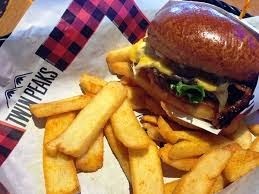 For a true burger lover though, these guys take an obsession to a whole new level. Their menu itself isn’t large, but the sandwiches sure are. Scrolling down the small list of sandwiches, I settled upon the Pigzilla, which seemed to be a special for the day. A burger topped with Sriracha-marinated pulled pork (yes! ), Swiss cheese, coleslaw, a thick slice of tomato, Burger Monster BBQ sauce, and ranch all between two sides of a brioche bun. The main problem I had with this sandwich happened to be that I didn’t exactly know how to eat it. It’s a very messy sandwich and not wanting to look like a five-year old after eating spaghetti-o’s, this presented a real problem. Luckily though, with the skills I have gained in eating sandwiches the past few years, I managed to escape without so much as a drop of red sauce on my clothes. The spicy and smoky pulled pork was delicious. It had a bit of tangy punch to it and was soaked with the BBQ sauce and Sriracha marinade. The Swiss cheese added a gooey texture with smoky flavor and the cole slaw added a slightly sweet crunch. The most impressive part of this sandwich was the brioche bun. Compared to the other ingredients it didn’t really add too much flavor or shine through because of the spicy, tangy, smoky barbecue flavor, but what it did do was hold together until the end. That is an accomplishment in itself for how much sauce is on this sandwich. What made it even better is that there was some bun left over to soak up the remaining sauce. Overall, this was an excellent follow-up to a great day at a comic book convention. 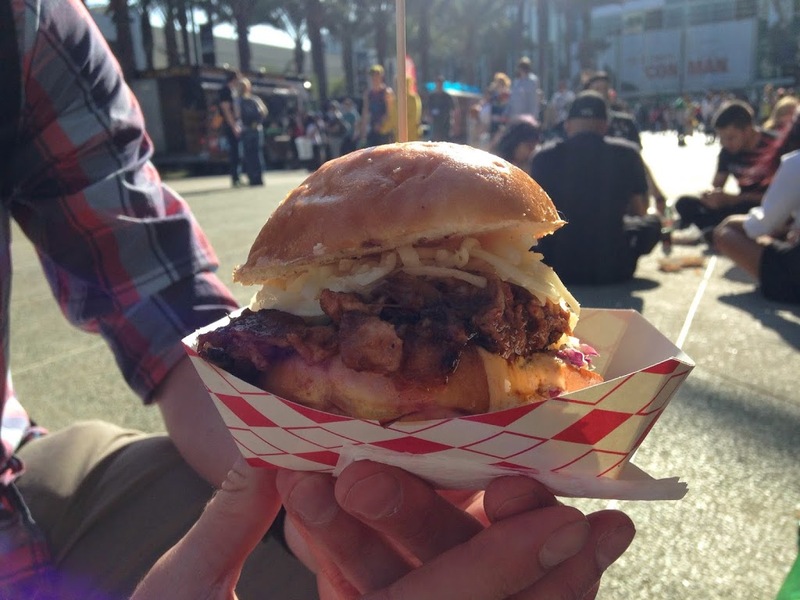 If you can find the Burger Monster truck while around Los Angeles and Orange County, I highly suggest you try them. Even if Pigzilla isn’t on the menu that day, the rest of their burgers sound equally delicious. They even have a vegetarian option for you non-meat eaters who might be interested. So, really, you don’t have an excuse to miss this truck. So, next week I’ll be in Hawaii, so I won’t exactly have a sandwich review for you (sorry!) but make sure you tune in the following week as I will start the first of a few reviews from the 50th state.